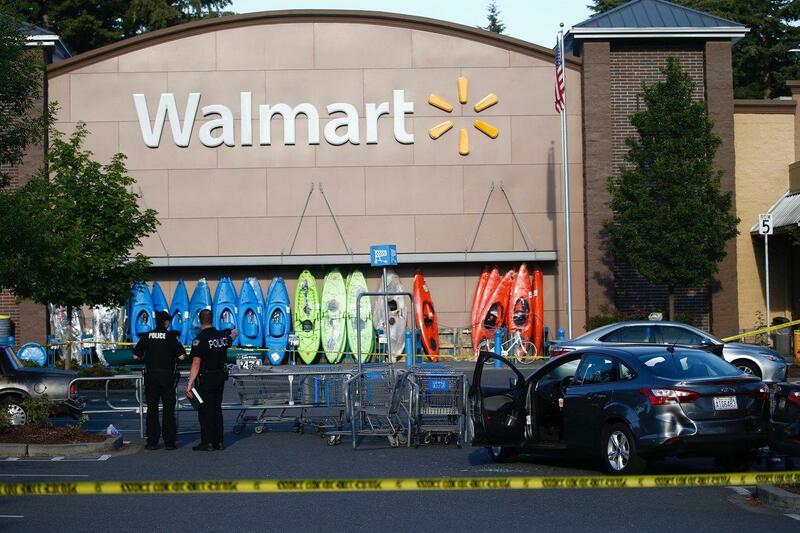 UPDATED: Thu., June 21, 2018, 10:30 p.m.
OAKVILLE, Wash. – As he heard the gunshots from the back of the Tumwater Walmart, David George wondered if his family was safe. And then the training kicked in. George isn’t just the pastor of the Oakville Assembly of God Church. He describes himself as a trained EMT with the town’s fire department, a certified gun-range safety officer and a licensed concealed-carry holder who has trained for active shooter situations. George is the man who has been called a hero for using the gun he carries to stop the bizarre and deadly rampage of carjackings and shootings by McCleary resident Tim O. Day that ultimately injured three people, one critically. On Wednesday morning, standing at a podium just outside the church’s open front doors in this town of about 685 people, George read a statement detailing his account of Sunday’s chaotic scene. After hearing the gunshots, George, who was standing near the store’s customer service desk, saw his daughter and granddaughter flee the building. Looking around, he couldn’t see his wife. By that point, Day, 44, had already created a dangerous uproar around Tumwater. According to the Tumwater Police Department, Day had attempted to take an occupied car at a gas station. Then he drove the wrong way down U.S. Highway 101, before exiting and crashing into another vehicle. He then attempted to carjack more vehicles, firing shots at the cars. By that point, two people had suffered minor injuries, and Day successfully hijacked the vehicle that brought him to Walmart. Court records show Day’s criminal history included violations of a domestic-violence protection order, felony assault and making death threats. But Tumwater police on Wednesday didn’t yet know precisely what sparked the frenzy. “He appeared to have maybe some mental health and drug issues and was acting somewhat paranoid,” said Laura Wohl, spokeswoman for the department. Day entered the Walmart, made for the back of the store and shot open a display case to get more ammunition. The gunshots sent customers and workers running for the exits, witnesses said. Day headed back toward the parking lot. At that point, “the gunman came past me waving and pointing his gun and exited the building,” George said. The pastor hooked up with another armed civilian, who news reports have identified as Jesse Zamora, of Kennewick. They followed Day outside, watching as he tried to take more vehicles. At some point, George drew his own firearm. He watched Day shoot twice into the driver’s side of a vehicle, critically injuring a man, and start to move toward where George thought his family might be. George got into a position “to have a safe shot” at Day. Day tried to take another car. George shot him. Day fell to the ground. George told Zamora to stay with Day while he retrieved a medical kit from his own vehicle, and administered aid to the injured man in the car. As of Wednesday evening, the man, who was airlifted to Harborview Medical Center, remained in critical condition. Kyle Fievez told the Olympian earlier this week that the injured man was his father and had been shot twice – in the shoulder near his neck and again in his side. An autopsy for Day was scheduled for Wednesday. A call Wednesday afternoon to the Thurston County Coroner was not returned. Flanked Wednesday by his wife and Oakville Fire Chief Bill Rodocker, George said he had been cleared of any wrongdoing in Day’s shooting, and had held off making public statements for several reasons, including giving authorities time to investigate. He didn’t take questions Wednesday. Choking up as he read his statement, George said he was grieved at the “reckless actions” of the carjacker. Published: June 21, 2018, 12:50 p.m. Updated: June 21, 2018, 10:30 p.m.